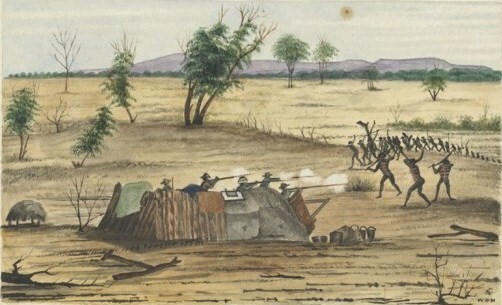 Nineteenth century Australia had fortifications erected to protect settlers against Indigenous attacks. Domestic architecture often had defensive features. The context in Southern Queensland in the 1840s and 1850s was that settlers were vastly outnumbered by Indigenous inhabitants. Whites feared blacks. The paper provides a detailed examination of the defensive elements of homestead and hut architecture. ‘What is worth noting’, the author writes, ‘is not only the frequency and military foresight of these bastions, but the fact that their heavily fortified nature was considered the common and essential state of affairs at this time’. While Gruguric has suggested this architecture was indicative of settler paranoia, there are contemporary accounts of attacks. The evidence suggests that squatters in the outlying districts were seen as the first line of defence (and perhaps offence) for the infant colony and there are frank admissions in the records, and reports in reminiscences, of squatters being used in this way. Police provided back-up where necessary. Finally, the paper describes how Indigenous groups constructed their own fortifications in response, setting up strongholds in natural bastions, with stocks of food and weapons and communicating through smoke-signals. They conducted raids, sometimes en masse. There were sometimes pitched battles with the settlers. A related paper by Ray Kerkhove on aboriginal guerilla tactics in Queensland.